ʿAlī b. Abī Ṭālib (Arabic: علي بن أبي طالب) (b. 23 before Hijra/600 - d. 40/661) is the first Imam of all the branches of the Shi'a, a companion, cousin, and son-in-law of the Prophet (s), and the fourth caliph of the Rightly Guided Caliphs in Sunni Islam. He was the husband of Lady Fatima (a), and the father of the rest of the Imams of the Shi'a. He was also the first convert to Islam and a scribe of the Qur'an. According to Shi'i historians and many Sunni scholars, he was born inside the Ka'ba. Based on evidence from the Qur'an, hadith, and history, the Shi'a believe that 'Ali (a) was the divinely designated successor of the Prophet (s). According to Shiite and some Sunni sources, roughly three-hundred verses of the Qur'an were revealed with regards to his virtues, including his infallibility and purity. When the Quraysh plotted to assassinate the Prophet (s), it was 'Ali (a) who slept where the Prophet (s) used to sleep, and thus helped the Prophet (s) to secretly leave for Medina. In the pact of brotherhood in Medina, the Prophet (s) chose 'Ali (a) as his brother. Except for the Battle of Tabuk when he stayed in Medina as the deputy of the Prophet (s), 'Ali (a) was with the Prophet (s) in all the battles. Contrary to what the Prophet had explicitly stipulated (nass), a group of people pledged allegiance with Abu Bakr in Saqifa immediately after the Prophet's (s) demise. Although Abu Bakr became the caliph and 'Ali's (a) right to the caliphate was usurped, he kept silent for 25 years. After the assassination of the third caliph, 'Uthman b. Affan, 'Ali (a) accepted the caliphate at the overwhelming insistence of the Muslims. During his short rule, he was faced with three rebellions and was ultimately assassinated by one of the Kharijites while praying in the Mihrab (the prayer niche) of the Great Mosque of Kufa, and was then secretly buried in Najaf. During the time of the first three caliphs, 'Ali (a) never hesitated to advise them in ways that he felt would benefit the Muslim nation. In fact, he was the one who suggested that the Hijra (the immigration of the Prophet (s) to Medina) could be used to mark the beginning of the Islamic calendar. However, his enemies fabricated many hadiths in order to curse him and damage his reputation. For a long time during the Umayyad era, they would curse him on all pulpits at the order of Muawiya. Further, 'Ali's (a) followers and admirers were constantly imprisoned and killed. The general population was even banned from naming their children 'Ali'. He is considered as the father of many Islamic sciences including Arabic literature, Islamic theology, jurisprudence, and exegesis. Scholars of different sciences have tried to trace back the chain of their hadiths to him. Nahj al-balagha is a selection of his speeches and letters. He was physically powerful and courageous, and at the same time he was patient, humble, and merciful. He confronted those who would flatterer him harshly, reminding them of the mutual rights between the people and their government. He constantly and actively sought justice. His lineage is 'Ali b. Abi Talib b. 'Abd al-Muttalib b. Hashim b. Qusayy b. Kilab. He was from Banu Hashim branch of Qurash. Ali's (a) father, Abu Talib was a generous and just man who was respected by various Arab tribes. He was the uncle and guardian of the Prophet (s) and was amongst the most noble personalities of the Quraysh. He passed away as a Muslim in the tenth year after the beginning of the Prophet's mission (619 CE), after supporting the Prophet (s) and his mission for several years. Ali's (a) mother was Fatima bt. Asad. His brothers were Talib, 'Aqil, and Ja'far. His sisters were Hind or Umm Hani, Jumana, Rayta or Umm Talib, and Asma'. Imam 'Ali (a) was born inside the Ka'ba in Mecca on Friday, Rajab 13, in the thirtieth year after the year of the elephant/September 29, 600. "When I was a young child, the Prophet (s) took care of me. He would bring me to his chest and I would sleep in his bed, so close to him that I could even smell his scent. He would chew food for me and then feed me with it. He found no lies in my speech, nor any shortcomings in my actions." His Kunyas were Abu l-Hasan, Abu l-Husayn, Abu l-Sibtayn, Abu l-Rayhanatayn, Abu Turab, and Abu l-A'imma. His titles were Amir al-Mu'minin (the Commander of the Faithful), Ya'sub al-Din wa l-Muslimin, Mubir al-Shirk wa l-Mushrikin, Qatil al-Nakithin wa al-Qasitin wa al-Mariqin, Mawla al-Mu'minin, Shabih Harun, Haydar, al-Murtada, Nafs al-Rasul, Akh al-Rasul, Zawj al-Batul, Sayf Allah al-Maslul, Amir al-Barara, Qatil al-Fajara, Qasim al-Jannat wa l-Nar, Sahib al-Liwa', Sayyid al-'Arab, Kashshaf al-Kurab, al-Siddiq al-Akbar, Dhu l-Qarnayn, al-Hadi, al-Faruq, al-Da'i, al-Shahid, Bab al-Madina, al-Wali, al-Wasi, Qadi Din Rasul Allah, Munjiz Wa'dah, al-Naba' al-'Azim, al-Siraṭ al-Mustaqim, and al-Anza' al-Batin. Amir al-Mu'minin, the Commander of the Faithful, is a title which is, according to Shiite belief, exclusively reserved for Imam 'Ali (a). Based on narrations, Shiites believe that this title was used for Imam Ali (a) in the time of the Prophet (s) and is exclusive to him. They believe that this title is not only inappropriate to use for other Rightly Guided caliphs, it should also not be used for other Imams (a). There are many reports about Imam 'Ali's (a) physical appearance. It is reported that he was slightly short and heavy, and had wide black eyes that were full of compassion and kindness. His eyebrows were long and joined together. He had a beautiful, smiling, and pleasing looks. He had a light brown complexion. He had hair around his head, but was bald on top. He had a rather pale neck and a full beard. His shoulders were wide, he had slender fingers, strong hands and strong forearms. He was so strong that when he would take someone's hand, they would feel his overpowering strength. He had a large stomach and a strong back. His chest was broad and hairy and his bones looked strong at the joints. He had tight muscles and long, thin legs. His muscles were in harmony. When walking, he would lean slightly forward. Ibn Abi l-Hadid says, "'Ali's (a) physical prowess was well-known. He was the one who lifted the gate of Khaybar, even when a whole group of the troops could not take it back to its place. He was the one who threw down the idol of Hubal (which was a large idol), from the top of the Ka'ba to the ground. He was also the one who lifted up a huge rock with his hands, while a spring gushed forth beneath it." The first wife of 'Ali (a) was Fatima (a), the daughter of the Prophet (s). Before 'Ali (a), a few others like Abu Bakr, 'Umar b. al-Khattab and 'Abd al-Rahman b. 'Awf, had voiced their readiness to marry her. However, the Prophet (s) had told them that he was waiting for the divine revelation with regards to her marriage. Historians disagree on the date of the marriage of 'Ali (a) and Fatima (a). Some have mentioned that it was the first of Dhu l-Hijja in the year 2/May 25, 624. Others have mentioned that it was in Shawwal/April 624 or on Muharram 21/July 25, 623. Together, they had five children named al-Hasan, al-Husayn, al-Muhsin, Zaynab al-Kubra and Umm Kulthum. Umama, the daughter of Abu l-'As b. Rabi'. 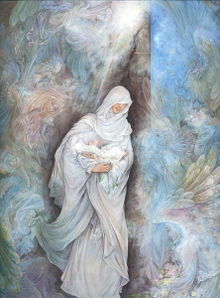 Umama's mother, Zaynab, was the daughter of the Prophet (s). Umm al-Banin, the daughter of Hazam b. Darim. Together, they had four children: 'Abbas, 'Uthman, Ja'far and 'Abd Allah who all were martyred in the event of Karbala. Layla, the daughter of Mas'ud b. Khalid al-Nahshali. Asma' bt. 'Umays, with whom he had two children: Yahya and 'Awn. Umm Habib, the daughter of Rabi'a al-Taghlabi named al-Sahba'. Khawla, the daughter of Ja'far b. Qays b. Maslama al-Hanafi (or according to another account, she was the daughter of Ayas). Together, they had Muhammad b. al-Hanafiyya. Muhayyat, the daughter of Imru' al-Qays b. 'Adi al-Kalbi. 'Ali (a) had an influential role in the battles and expeditions of the early years of Islam and fought with the Prophet (s) in all of them, save for the Battle of Tabuk.in which he remained in Medina as the deputy of the Prophet (s). The Battle of Badr was the first battle between the Muslims and the idolaters of Mecca. It took place on Friday, the Ramadan 17, 2/March 13, 624 along the wells of Badr. In this battle, the Muslims killed seventy of the idolaters, including a few influential chiefs like Abu Jahl, 'Utba, Shayba, and Ummayya. It was an Arab custom to precede the general battle with a few one-on-one combats. So, 'Utba b. al-Rabi'a, his son, Walid, and his brother, Shayba came forward and wanted the Prophet (s) to send a few worthy opponents to the battlefield to fight with them. The Prophet (s) sent 'Ali (a), Hamza and 'Ubayda b. Harith. 'Ali (a) struck Walid quickly, as did Hamza to 'Utba, killing them quickly. They then went on to help 'Ubayda against Shayba, killing him too. Of the 70 casualties of the polytheist around 20 were killed by 'Ali. 'Ali (a), Hamza, Abu Dujana and a few others led the Muslim army in the Battle of Uhud, disheartening the enemy's ranks. However, a group of polytheists managed to encircle the Muslims army. With every group of the Quraysh army attacking the Prophet (s), 'Ali (a) would counterattack against them at the command of the Prophet (s). Paying tribute to the dedication that 'Ali (a) showed, the archangel Gabriel, in praise of 'Ali's self-sacrifice, said to the Prophet (s): "This is the ultimate devotion that 'Ali has shown." The Prophet (s) agreed with Gabriel and said, "I am from 'Ali and he is from me." A voice then echoed in the sky, saying, "La fata illa 'Ali, la sayf illa Dhu l-faqar" which means "There is no youth like 'Ali (a), and there is no sword like Dhu l-Faqar (the sword of 'Ali (a))"
In the Battle of Khandaq (trench), as suggested by Salman al-Farsi, the Muslims dug a trench around Medina in order to keep the enemy away from the city. For several days, the two armies confronted each other on opposite sides of the trench. They would sometimes fight, throwing stones and arrows. Finally, 'Amr b. 'Abd Wad (from the army of the polytheists), along with a few others, jumped over the trench at its narrowest part and managed to reach the other side. 'Ali (a) asked the Prophet (s) to give him permission to fight 'Amr, and the Prophet (s) accepted. After fighting with 'Amr, 'Ali (a) knocked him down and killed him. After the battle the Prophet (s) said, "The hit of 'Ali (a) [to 'Amr] during this battle, is more valuable than the worship of all jinns and human beings." The Battle of Khaybar occurred in Jumada I 7/628, when the Prophet (s) issued a command to attack the Jewish fortresses due to their threats. After a few men, like Abu Bakr and 'Umar, could not conquer the forts, the Prophet (s) said, "Tomorrow I will give the flag to a man who loves God and His prophet, and God and His prophet also love him." The next morning, the Prophet (s) called 'Ali (a) and gave the flag to him. 'Ali (a) took his sword, Dhu l-Faqar, and went to the battlefield. When he lost his shield during the fight, he lifted up one of the gates of the fortress and used it as a shield until the end of the battle. In the beginning of Ramadan in 8/630, the Prophet (s) traveled to Mecca from Medina with the intention of conquering Mecca. After Sa'd b. 'Ubada, one of the standard bearers, chanted slogans about revenge; the Prophet (s) sent 'Ali (a) to take the flag from Sa'd and chant a slogan about mercy. After the Conquest of Mecca, the Prophet (a) entered Ka'ba and broke the idols in it, then 'Ali (a) climbed onto the shoulders of the Prophet (s) and threw down the idol of Khuza'a tribe. The Battle of Hunayn occurred in 8/629. The war occurred because the chiefs of the Hawazin and Thaqif tribes decided to take preemptive action against the Prophet (s) in fear that he was going to attack them after the Conquest of Mecca. 'Ali (a) led Muhajirun and killed about 40 people from the enemy's army. The battle of Tabuk was the only battle led by the Prophet (s) in which 'Ali (a) did not participate. He stayed in Medina at the Prophet's command in order to protect the city in the Prophet's (a) absence against the plots of the hypocrites. Soon after the Prophet (s) left for war, the hypocrites began to spread rumors about the Prophet (s) being not pleased with 'Ali that he didn't want him to go. In order to put a quick end to the vicious rumours, 'Ali (a) immediately rushed towards the Prophet (s) who was outside of the city and informed him of the matter. It was here that Hadith al-Manzila ('the hadith of position') was narrated by the Prophet (s). He stated, "My brother, 'Ali! Return to Medina, since nobody except me or you,has the competence to handle these affairs. Thus, you are my vicegerent and successor amongst my Ahl al-Bayt and my people. Are not you pleased [to know] that you are in the same position (Manzilah) to me as that of Aaron to Moses, except that after me there will be no other prophet?" This verse, according to all Shi'a scholars and many Sunni scholars, was revealed with reference to 'Ali (a) and the other Imams (a), and affirms the necessity of obeying them. This verse proves the wilaya (guardianship) of 'Ali (a). Scholars of Qur'anic exegesis consider this verse to have been revealed about Imam 'Ali (a) and that it was revealed when he gave his ring to a poor man whilst bowing down (ruku') in prayer. The Prophet (s) said to 'Ali (a), "To me, you are like Aaron in his position to Moses, except that there is no prophet after me." When the Prophet (s) informed his close relatives of his mission and invited them to Islam, only 'Ali (a) accepted his invitation. The Prophet (s) then said to him, "You are my brother, my helper, my heir and my successor after me." After completing the hajj rituals, the Prophet (s) left Mecca to return to Medina with a large group of people accompanying him. On the Dhu l-Hijja 18/March 16, when the caravan had reached a place called Ghadir Khumm near Juhfa, the Prophet (s) received a revelation from God that he should announce 'Ali (a) as his successor. He ordered everyone to stop in their travels, and to wait until all of the pilgrims gather together, giving time for those who were behind to catch up and for those who had gone ahead, to return. After the revelation of this verse, the Prophet (s) addressed the people, "Do I not have more of a right over the believers than the rights that they have over themselves?" People cried and answered, "Yes, O' Messenger of God!" Then, he stated, "Whoever I am the master of (mawla), 'Ali (a) is also his master (mawla). O God! Befriend those who befriend him, and be enemies with those who are his enemies, support those who support him, and humiliate those who humiliate him." In the last moments of the life of the Prophet (s), 'Ali (a) came next to him and the Prophet (s) told him a long secret. When the Prophet's (s) illness worsened, he told 'Ali (a): "Put my head onto your lap, since a divine command has come and said that when my soul departs my body, you should take it by your hand and pass it over your face, and then direct my body towards the qibla, prepare me for burial, and pray over my body before others. Do not leave my side until you have buried me in the earth, and ask God, the Exalted, for help." While Imam 'Ali (a) and other members of the Banu Hashim were busy preparing for the Prophet's (s) burial, some of the Muhajirin and the Ansar, (including Abu Bakr, 'Umar, Abu 'Ubayda, 'Abd al-Rahman b. 'Awf, Sa'd b. 'Ubada, Thabit b. Qays, and Uthman b. 'Affan), gathered at a place called Saqifa Bani Sa'ida in order to decide the future leadership of the Muslims. After a few disputes, (and not taking the event of Ghadir into consideration), they decided that Abu Bakr would be the first caliph after the Prophet (s). Under the leadership of the first three caliphs, there were a few tragic events in the lives of the Ahl al-Bayt (a). This included the invasion to the home of 'Ali (a) in order to secure his allegiance for Abu Bakr, the illegal confiscation and usurpation of Fadak, and the martyrdom of the Lady Fatima (a). Under the governance of first three caliphs, which lasted 25 years, Imam 'Ali (a) did not alienate himself from the affairs of the Muslim community. In fact, he contributed to many scholarly endeavors and social services. This included activities like the compilation of the Qur'an (Mushaf of Imam 'Ali), and advising the three caliphs with regards to religious issues, conquests, and governance. He continued to give extensive charity to the poor and the orphans, and bought and freed a thousand slaves. He would farm and plant trees, dig canals, build mosques (like the Fath mosque in Medina, a mosque near the grave of Hamza, in Miqat, in Kufa, and in Basra). He would also dedicate (waqf) real estates and places for religious causes, whose annual income was 40,000 dinars. Some of the most important historical events of the period is as follows. When Imam 'Ali (a) and a few companions refused to swear allegiance to Abu Bakr, this proved to be a serious problem for Abu Bakr and 'Umar. The two decided to address this problem by forcing Imam 'Ali (a) into pledging allegiance with Abu Bakr. After refusing to pledge allegiance several times, Qunfudh was sent by Abu Bakr to Imam 'Ali's house in order to secure allegiance for Abu Bakr. Imam 'Ali (a) refused again. 'Umar then advised Abu Bakr: "You yourself should get up and go to Imam 'Ali." Thus, Abu Bakr, Umar, 'Uthman, Khalid b. al-Walid, al-Mughira b. Shu'ba, Abu 'Ubayda al-Jarrah and Qunfudh went to the house of Imam 'Ali (a). When they arrived at his house, they insulted Lady Fatima (a) and slammed the door on her such that she became stuck between the door and the wall (which caused her a severe injury which later lead to her martyrdom). When she came out of house, they whipped her and attacked Imam 'Ali (a), wrapping his clothes over his neck, and taking him by force towards Saqifa Bani Sa'ida. When he was taken towards Saqifa Bani Sa'ida, they asked him to pledge allegiance with Abu Bakr. Imam 'Ali (a) replied: "I am worthier than you with regards to the caliphate and I shall never pledge allegiance to you. Rather, you ought to pledge allegiance to me, since you took the caliphate over the Ansar according to your relationship with the Prophet (s) [while my relationship is closer], and now you usurp it from me...."
Both Shi'a and Sunni scholars agree that Imam 'Ali (a) was the pioneer in compiling the Qur'an according to the will and advice of the Prophet (s). It is related in a tradition that Imam'Ali (a) swore an oath not to wear his robe [and exit his home] until he had finished compiling the Qur'an. It is also said that Imam 'Ali (a) compiled the Qur'an within six months of the death of the Prophet (s). When Abu Bakr became caliph, he was hesitant to carry out the Prophet's (s) command to fight the Romans (as the Prophet (s) had commanded before his death). So, he consulted with the Companions. Each of the companions advised differently, but none of them could convince Abu Bakr of what to do. Finally, Abu Bakr consulted Imam 'Ali (a) who urged him to act according to the commands of the Prophet (s) and said, "If you fight, you will win." Abu Bakr was pleased with his encouragement and said, "It was a good omen and you brought me good tidings." Imam 'Ali (a) was the one who suggested that 'Umar set the immigration of the Prophet (s) from Mecca to Medina as the beginning of Islamic calendar. After the assassination of 'Uthman, a group of the Companions came to Imam 'Ali (a) and said, "we do not know anyone better than you for the caliphate". He responded by saying, "it is better for me to be your helper as opposed to your leader." They said, we will not accept anything short of pledging our allegiance to you as the next caliph." However, he said that this allegiance would have to be given to him publicly in the mosque, as opposed to secretly. Except for few, all of the people pledged allegiance to Imam 'Ali (a). But he did not make the opposition to allegiance. As to why he did not initially accept the caliphate, it should be noted that he knew the community was too corrupt to be led by him and to comply with his uncompromising moral standards. "In the same way that one has rights over the other, the latter also has rights over the former. The only one who has rights over everyone whilst none have rights over Him, is Allah. This does not apply to any of His servants." "If subjects fulfill the rights of the ruler and the ruler fulfills the rights of their subjects, then rights attain a position of honor amongst them. The ways of the religion become established, the signs of justice become fixed, and the Sunna gains currency." "If subjects gain sway over their ruler, or the ruler oppresses their subjects, then discord will be sewn. In every word, signs of oppression will appear, mischief will enter the religion, and the ways of the Sunna will be forsaken. Then, [people will] act on their desires, discard the commands (of religion), and [become] seriously diseased in the spirit. There will be no hesitancy in disregarding the most important of rights, nor in committing the biggest of wrongs. In these circumstances, the virtuous will be humiliated while the vicious will be honored, and there will be serious chastisements from Allah, the Glorified, onto the people." "Behave justly with the people and be patient with regards to their needs, because you are the treasurer of the people, a representative of the community, and an ambassador of the Imams." "Do not frighten any Muslim. Do not pass over his lands so as to make him feel uneasy. Do not take more than Allah's share from his property. When you visit a tribe, you should stop at their watering place as opposed to entering their houses. Proceed towards them with peace and dignity until you meet them. Then salute them and do not forget to greet them. Then say to them, 'O servants of Allah, the vicegerent of Allah and His caliph have sent me to collect Allah's share in your properties. Is there anything of His share in your properties? If so, give it to His vicegerent.' If someone responds in the negative, then do not repeat the demand. If someone responds in the affirmative, then go with him without frightening him, or threatening him…"
"Habituate your heart to mercy for your subjects, and to affection and kindness for them. Do not stand over them like greedy beasts who feel as though they should devour them. They (your subjects) are of two kinds: either your brother in religion or like you in humanity/creation." "The Arabs, non-Arabs, and all Muslims from every tribe and ethnicity should receive an equal share from the public treasury." Moreover, when Imam 'Ali (a) accepted the caliphate, he ordered that the lands that 'Uthman had given to different people be restored to the treasury as it was 'the property of God'. Imam 'Ali (a) was so strict with regards to dealing with justice with the public treasury, that when his daughter only borrowed a pearl necklace from 'Ali b. Abi Rafi', the keeper of the public treasury, he gave both her and him a stern warnings. On another occasion, Imam 'Ali (a), in response to a financial request from one of his companions, said: "This property is neither mine, nor yours. Rather it is war booty that was obtained for the Muslims by their swords. If you had participated in the war alongside them, you would have received a share equal to theirs. However, [as this is not the case], it is not becoming for what they have earned by their own hands to be eaten by anyone else." Once, 'Ali (a) ordered Qanbar to punish someone with a number of lashes as per the legal punishment (hadd). Overcome with emotion, Qanbar added three more lashes. However, 'Ali (a) made the man retaliate and lash Qanbar three times for the injustice of the three additional lashes. One night, a rich man from Basra invited 'Uthman b. Hunayf (the governor of Basra) to a party and arranged to meet him at the party. 'Ali (a) heard about the gathering and instantly wrote a letter to 'Uthman b. Hunayf, saying: "O' Ibn Hunayf!, I have come to know that a young man from Basra invited you to a feast and you leaped towards it. Various types of foods of different colors were offered to you, and large bowls were being given to you. I never fathomed that you would accept an invitation to a feast from people who turn out beggars and invite the rich... Realize that your Imam has contented himself with two shabby pieces of cloth from the (comforts of the) world and two loaves (of bread) for his meal." When returning from the Battle of Siffin, a man named Harb b. Shurahabil was walking with Imam 'Ali (a) who was on horseback. Imam 'Ali (a) stopped him and said to Harb, "Go back!" When Harb refused, he told him, "Go back, since such a person as you going on foot accompanying such a person as me brings trouble for the governor and ruler, and humiliation and disgrace for a believer." "In the view of the virtuous people, the worst state of a ruler is that they are thought to love glory, and that their affairs are shaped on pride. I would hate for it to occur to your mind that I love to be flattered or to hear eulogies. By the grace of Allah, I am not like this. Even If I loved to be mentioned like this, I would have forsaken it in submissiveness to Allah, the Glorified, rather than accept greatness and sublimity to which He is more entitled. Generally, people become pleased when they are praised after a good performances, but do not praise me for the obligations that I have discharged towards Allah and towards you…"
When 'Ali (a) led his army towards Syria, and they approached the city of al-Anbar, local peasants were standing in rows and ran forward to welcome him happily. Then he said, "What a wrong action you have done!" They said: "This is our custom and the way in which we show our respect to our governors." 'Ali (a) said, "By Allah, this does not benefit your leaders. You are yourself into hardship in this world and earning misery for the next world by doing so." 'Ali (a) knew that the army was a source of confidence for the people, dignity for the governors, glory for the religion, and security for the state. The army's success was contingent on the economic situation of the state and the taxes given by people, government agents, traders, and industry owners and their stability and strength for protecting the country depend on the overall government system. With regards to recruiting army members, he said, "Associate with considerate people from high families, virtuous houses and decent traditions, and then people of courage, valor, generosity and benevolence… there should be a close relationship between them and the leader of the Ummah, and they should be supported financially." "The elites of a nation impose a heavy burden on the government, since they show less support in times of hardship, more discontent with an administration of justice and they are less resistant against problems. However, the general public forms the standing pillars of religion, grandiose Muslim congregations and society and reserved armed forces." From among the governors of 'Ali (a), some were killed, like Malik al-Ashtar, Muhammad b. Abi Bakr, 'Abd Allah b. Khabbab, Muhammad b. Abi Hudhayfa, Abu l-Hasan b. al-Hassan al-Bakri, and Hulw b. 'Awf. Some also died of old age in the time of 'Ali (a), such as, Sahl b. Hunayf, Abu Qatada, and Hudhayfa b. Yaman. However, some continued as governors until they died, like Qays b. Sa'd, 'Uthman b. Hunayf, Kumayl b. Ziyad, Sa'd b. Mas'ud and Sulayman b. Surad. There were also some who failed in performing their duties and were rebuked like, 'Ubayd Allah b. al-'Abbas and Sa'id b. Namran. Imam 'Ali (a) also dismissed and removed some governors due to their disloyalty like Mundhir b. Jarud and 'Uqba b. 'Amr. "One who goes too far in quarreling has sinned, and one who falls short in it [quarreling], becomes oppressed. And someone who quarrels is unable to be God-wary." The first battle that Imam 'Ali (a) engaged in during his caliphate was with the Nakithun. Since Talha and al-Zubayr and their followers first pledged allegiance to Imam 'Ali (a) but later broke it, they were called the Nakithun i.e. "the violators". The battle took place in Jumada II of 35/655. Talha and al-Zubayr had hoped to be elected as caliph, but since they failed to achieve this and 'Ali (a) had assumed the caliphate, they wanted and expected a share in the caliphate. As such, they asked 'Ali (a) to appoint them as rulers of Basra and Kufa. However, 'Ali (a) did not deem them worthy of it. Therefore, even though they were themselves suspected to have been involved in the assassination of 'Uthman, and Talha had been eager to kill 'Uthman, they allied with 'A'isha in a strategic move to supposedly avenge his murder. However, during the siege of 'Uthman, 'A'isha did nothing to help him, and had even called the invaders, "the seekers of truth". However, when 'A'isha heard that following his murder, people were pledging allegiance with Imam 'Ali (a), she decided to raise the issue that 'Uthman had been killed unjustly and sought his revenge. 'A'isha bore some rancor towards 'Ali (a) and hence allied with Talha and al-Zubayr against him. They mobilized an army of 3,000 troops and moved toward Basra. In this battle, 'A'isha mounted a camel named 'Askar, and thus the battle was named "Jamal" meaning "camel". As per the order of Imam 'Ali (a), 'Uthman b. Hunayf (the governor of Basra) invited the rebels to the truth and only when they refused to accept did he fight until Imam 'Ali (a) came. Upon his arrival in Basra, Imam 'Ali (a) urged those who broke their allegiance to avoid the battle. However, he was not successful and they began the battle by killing one of Imam 'Ali's (a) companions. Also, al-Zubayr withdrew from the army before the battle began due to a hadith that Imam 'Ali (a) had reminded him of: a hadith in which the Prophet (s) had told al-Zubayr: "You will rise up in a battle against 'Ali (a)". He was then killed outside Basra by 'Amr b. Jurmuz. After several hours of fighting and suffering many losses, the camp of Jamal was defeated. In this battle, Talha was killed and thereafter 'A'isha was sent back to Medina in a respectful manner. Though he was capable, Mu'awiya did nothing to help 'Uthman when he was under siege. After the killing of 'Uthman, Mu'awiya tried to introduce 'Ali (a) as the murderer of 'Uthman to the people of Syria. In the beginning of his rule, Imam 'Ali (a) wrote a letter to Mu'awiya, calling on him to pledge allegiance. However, he responded with the condition that 'Ali (a) first had to surrender the murderers of 'Uthman who were supposedly around 'Ali (a) and to punish them. Only then would he pledge allegiance. After several letters and dispatching a few delegates to Mu'awiya, Imam 'Ali (a) saw that Mu'awiya was pursuing a fight, and so, Imam 'Ali (a) took his armies towards Syria. Mu'awiya also set out with his army, and the two armies encamped in Syria near the Euphrates in a place called Siffin. As Imam 'Ali (a) refrained from war wherever possible, he sent some letters to Mu'awiya. However his attempts were futile, and the battle began in Safar 37/August 657. In the last confrontation of the battle, when Imam 'Ali's (a) armies were about to win, Mu'awiya, on advice from 'Amr b. al-'As, ordered his soldiers to hoist any Mushaf (part or complete copies of the Qur'an) available in the camp on their spears and to move towards the front of 'Ali's army, calling on them to accept the Qur'an. The decoy worked and some of Imam 'Ali's (a) army, especially those amongst the reciters of the Qur'an, came to Imam 'Ali (a) and said, "We shall not fight these people and we need to accept whatever they say". Although Imam 'Ali (a) had told them that it was a trick that they were using to escape fighting, they did not accept it. Imam Ali (a) was thus forced to accept arbitration through a letter to Mu'awiya, but said, "We know that you are not the people of the Qur'an". It was agreed that one arbitrator from each of the armies of Syria and Iraq would meet and judge the situation by referring to the Qur'an's edict. The army of Syria appointed 'Amr b. al-'As. Al-Ash'ath and a group from Imam 'Ali's (a) army (who later became members of the Kharijites) proposed Abu Musa al-Ash'ari. However, 'Ali (a) recommended Ibn 'Abbas and/or Malik al-Ashtar, who were rejected by al-Ash'ath and his friends. They were rejected under the pretext that Malik supported the war and that Ibn 'Abbas was not suitable because 'Amr b. al-'As was from Mudar, thus the other party had to be from Yemen. Finally, 'Amr b. al-'As managed to trick Abu Musa and ended the arbitration in favor of Mu'awiya in Ramadan 38/February 659. "Yesterday, I would give command, and today I am given commands! Yesterday, I prescribed [people from doing things], and today I am being prescribed to! You only like to live, so it is not appropriate for me to force you to do what you dislike." Nahj al-balagha, Sermon no. 208. The arbitration in the battle of Siffin ended in protest and opposition from some of Imam 'Ali's (a) companions, who were upset with what had happened, asking: "Why did he accept the arbitrator's judgment upon divine edict?" They said this even though Imam 'Ali (a) had opposed the arbitration and it was them who had forced him into accepting the arbitrator's judgment. This group split off and later became known as the Kharijites or Mariqun. They eventually proceeded to assassinate people. They killed 'Abd Allah b. Khabbab whose father was one of the companions of the Prophet (s) and tore his wife's stomach open even though she was pregnant, and killed the child as well. Because of this, Imam 'Ali (a) was forced to fight with them. Before the battle began, he sent 'Abd Allah b. al-'Abbas to speak with them, but this was futile. Finally, Imam 'Ali (a) himself went to them and talked to them. Some of them repented, but many held on to their beliefs. Eventually, the battle began and none of them survived except nine, whilst only seven or nine companions of 'Ali (a) were killed. After the Battle of Nahrawan, 'Ali (a) tried again to mobilize the Iraqis for a battle against Mu'awiya. However, none except a few accompanied him. On the other hand, Mu'awiya, who was aware of the situation in Iraq and their passivity, invaded regions under 'Ali's control (a) and attempted to debilitate his power by invading Iraq. "May God grant me better than them (people) and appoint worse than me over them." On the morning of Ramadan 19, 40/January 26, 661, (during the days in which 'Ali (a) was mobilizing an army for Siffin), he was struck with a sword by Abd al-Rahman b. Muljam al-Muradi and martyred from its injury two days later. Historical accounts have reported the collaboration of three Kharijites in an attempt to kill three individuals: 'Ali (a), Mu'awiya, and 'Amr b. al-'As. Some accounts have also mentioned the role of a woman named Qutam in this assassination, however, this seems to be more of an embellishment as opposed to fact. Al-Hasan (a), al-Husayn (a), and Muhammad b. al-Hanfiyya, accompanied by 'Abd Allah b. Ja'far buried him in Ghariyyayn (present day Najaf) and hid his grave. This was because if the Banu Umayya or the Kharijites knew about his burial place, they would exhume his body and treat it with disrespect. Only his children and a few companions knew of his burial place. 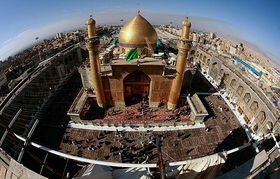 It wasn't until the era of al-Mansur al-'Abbasi in 135/753, when Imam al-Sadiq (a) revealed that the location of his grave was in Najaf. There are a few hadiths narrated from 'Ali (a) that contain his advice to his children with regards to his funeral rites: the way of his burial, ablution, shrouding and the performing of prayers over his body. He also asked them to hide his tomb and to keep its location a secret. "I advise you (both) to fear Allah and not to pursue the (pleasures of this) world even though they may run after you. Do not be sad over anything of this world that you have been denied. Speak the truth and act (in expectation) for reward [from God]. Be an enemy of the oppressor and a helper of the oppressed. I advise you (both), all my children, all members of my family, and everyone that my writing may reach: to fear Allah, to keep your affairs in order, and to maintain good relations amongst yourselves- for I have heard your grand-father [the noble Prophet (s)] saying, "Solving disagreements is better than years of praying and fasting." (Fear) Allah (and) keep Allah in mind with regards to orphans. Do not allow them to starve and they should not be harmed in your presence. (Fear) Allah (and) keep Allah in mind with regards to your neighbours, because they were a subject of the Prophet's advice. He would advise extensively in their favour such that we thought he would allow them a share in inheritance. (Fear) Allah (and) keep Allah in mind with regards to the Qur'an. No one should surpass you when acting in accordance to it. (Fear) Allah (and) keep Allah in mind with regards to prayer, because it is the pillar of your religion. (Fear) Allah (and) keep Allah in mind with regards to your Lord's House (the Ka'ba). Do not forsake it as long as you live, because if it is abandoned, you will not be spared. (Fear) Allah (and) keep Allah in mind with regards to the Jihad by helping with your property, lives and tongues in the way of Allah. You should have respect for kinship and spend for others. Don't turn away from one another and don't sever relationships. Do not cease enjoining the good and forbidding the evil, lest the mischievous dominate you. And then [after this], if you will pray, yor prayers will not be granted. Then he said: O' sons of 'Abd al-Muttalib, certainly I do not wish to see you plunging harshly into the blood of Muslims shouting "'Amir al-Mu'minin has been killed!". Beware, do not kill anyone because of me except for my killer. Wait until I have died by his (Ibn Muljam's) strike. Then, strike him once for his strike on me, and do not dismember his limbs, for I have heard the Messenger of Allah (s) saying, "Avoid cutting limbs even if it is a rabid dog." On the day of mubahala in 10/631, the Prophet (s) and the Najran Christians agreed to curse one another, until Allah punished those who were on the wrong path. So, the Prophet (s) took 'Ali (a), Fatima (a), al-Hasan (a), and al-Husayn (a) with him. When the Christians saw that he was so confident in his success that he had only brought his closest relatives, they grew apprehensive and accepted to pay the jizya instead of going through with the challenge. In the verse 'Ali (a) is mentioned as the soul of the Prophet (s) ("our souls and your souls"). According to Shi'a scholars, this verse was revealed to the Prophet (s) in the house of his wife Umm Salama. During its revelation, 'Ali (a), Fatima (a), al-Hasan (a), and al-Husayn (a) were also there with him. After the verse was revealed, the Prophet (s) used his cloak to cover himself, 'Ali (a), Fatima (a), al-Hasan (a), and al-Husayn (a)-the Ashab al-Kisa' (people of the cloak). Raising his hands in prayer, he said, "O God! My Household are these four people. Remove any impurities from them." Ibn 'Abbas says: "When this verse was revealed, I asked the Prophet (s) who were those whom love for them had become obligatory. He (s) stated, "'Ali, Fatima, al-Hasan, and al-Husayn". He repeated this three times." It is a well-known and widely transmitted hadith that 'Ali (a) was the first Muslim. As the Prophet (s) stated, "the first one who will meet me at the pond of Kawthar on the Day of Resurrection is 'Ali, the pioneer amongst you in Islam." In another narration, the Prophet (s) said to his daughter, Fatima (a) that, "Does it not please you that I urge you to marry a man from my Umma, who believed in Islam prior to anyone else, and who is the most learned and the most patient among them?" After the Muslims were severely persecuted by the Quraysh, the Prophet (s) ordered his companions to emmigrate to Medina, and so they gradually left Mecca. After exchanging ideas in the Dar al-Nadwa meeting, the Quraysh decided to designate brave young men from each tribe to assassinate the Prophet (s) in his house. The archangel Gabriel came to the Prophet (a), informed him of their plot, and commanded him not to sleep in his bed and to leave Mecca and emigrate to Medina that same night. The Prophet (s) informed 'Ali (a) of the enemy's plot and asked him to sleep in his bed to fool the enemy. After his emigration to Medina, the Prophet (s) created bonds of brotherhood between the Muhajirin and the Ansar. Both times, he told 'Ali (a), "You are my brother in this world and in the hereafter", and so he established a bond of brotherhood between himself and 'Ali (a). In 7/628, the Prophet (s) and 'Ali (a) prayed the noon prayer. The Prophet (s) then sent 'Ali (a) on a mission when he had not yet prayed the 'asr prayer. After 'Ali (a) returned, the Prophet (s) laid his head on 'Ali's (a) lap and slept until the sun set, and the time for prayer had expired. When the Prophet (s) woke up, he prayed to God saying, "O God! Your servant, 'Ali (a), dedicated himself for his Prophet (s). Turn the sun back for him." The sun returned, and 'Ali (a) made an ablution before prayer and performed his 'asr prayer after which the sun set again. The first verses of Quran 9 state that the polytheists had four months to accept monotheism and to become Muslims. However, if they were to refuse stubbornly, the Qur'an warns that they should be ready for war. When the verses were revealed, the Prophet (s) was not planning on attending the hajj to deliver its message. So, according to the divine decree that, "such messages should be delivered by the Prophet (s) himself, or by one who is from him and nobody else is competent to do so" , the Prophet (s) called 'Ali (a) and ordered him to go to Mecca so that on the Eid al-Adha he could deliver these verses to the polytheists in Mina. The Prophet (s) said, "Ali (a) is with the truth, and the truth is with 'Ali (a)." The Prophet (s) ordered that all doors opening to the mosque of the Prophet (s) (al-Masjid al-Nabawi) should be locked except for the door of 'Ali's house (and his own). When the Prophet (s) was asked of the reason, the Prophet (s) said, "I was ordered to lock the doors except that of 'Ali's (a). However, there is a lot of talk about it. I swear by God that I never locked or opened any door, except that I was ordered to do so and thus did it." In the introduction to his commentary on Nahj al-balagha, Ibn Abi l-Hadid, a 7th/13th century Sunni scholar, says: "What can I say about the man whose enemies acknowledged his virtues as even they could not deny or hide them. Indeed, Banu Umayya took power from the east to the west of Islamic states, and tried to extinguish the light of 'Ali's (a) glory, using any means and tricks. They fabricated many hadiths about cursing him and they cursed him on all pulpits. They not only threatened his admirers, but they killed them and banned them from quoting any tradition that implied his virtues or promoted his name. They even banned naming children after him. However, all of these attempts resulted in nothing except for the exaltation of his glory. He was like a musk: the more of it that is secreted, the more it sweetens the air." He continues, "What can I say about a man who is the origin of every human virtue and excellence; to whom every school and group trace back their origin and find honor. He is the origin of all excellences and surpasses others and is the pioneer of all arenas." Ibn Abi l-Hadid says, "Theology and knowledge of the divine attributes, the noblest of knowledges, was first elaborated on by 'Ali (a) and the greatest scholars of this field were all his students. Mu'tazilites who believed in the unity and justice [of God] are his students and companions. This is because of the fact that the head of their order, Wasil b. 'Ata' was a student of 'Abd Allah b. Muhammad b. al-Hanafiyya who was a student of his father who was a student of 'Ali (a). Ash'arites also owe their origin to 'Ali (a), given that its founder, Abu l-Hasan al-Ash'ari was a student of Abu 'Ali al-Juba'i whose teacher was one of the Mu'tazilites. So, the Ash'arites also trace back to the teacher of the Mu'tazilites who is Imam 'Ali (a). Attribution of Imami (Twelver Shi'a) and Zaydis to 'Ali (a) is self-evident and does not require an elaboration. Ibn Abi l-Hadid says, "'Ali (a) established the basics of jurisprudence and every jurist has learned from him. Tracing back Shi'a jurisprudence to him is self-evident and does not require an explanation. The followers of Abu Hanifa, like Abu Yusuf, Muhammad, and others learned their jurisprudence from Abu Hanifa. Ahmad b. Hanbal was a student of al-Shafi'i, who learned jurisprudence from Abu Hanifa who was a student of Imam al-Sadiq (a) who had learned from his father Imam al-Baqir (a)-- and so the jurisprudence taught eventually reaches 'Ali (a). Malik b. Anas learned jurisprudence from Rabi'at al-Ra'y, who was a student of 'Ikrima who was a student of 'Abd Allah b. al-'Abbas who was a student of 'Ali (a). Since al-Shafi'i was a student of Malik, he can also be called a student of 'Ali (a). Accordingly, the four Sunni jurists can be traced back as students of 'Ali (a). The companions of the Prophet (s), 'Umar b. al-Khattab and 'Abd Allah b. al-'Abbas have also both learned from 'Ali (a). It is a well-accepted fact that Ibn 'Abbas was a student of 'Ali (a). Further, it is an undisputed fact that Umar referred to 'Ali in difficult issues and more than once was reported to have said, "If it were not for 'Ali, Umar would have perished." He also said, "God forbid that I were to face a difficulty in which Abu l-Hasan (i.e. 'Ali (a)) would not be beside me." Elsewhere he said, "Unless 'Ali (a) is present in the mosque, nobody has the right to issue any ruling." With all of this as evidence, we can determine that 'Ali was the originator of Islamic jurisprudence. Shi'as and Sunnis have narrated that the Prophet (s) said: "The best judge among you is 'Ali (a)." Given that judging is part of jurisprudence, it can be said that 'Ali (a) is the most learned jurist among the companions. Ibn Abi l-Hadid says, "'Ali (a) was the founder of Qur'anic exegesis and anyone who refers to the commentaries of the Qur'an will find this claim to be true. It is either directly quoted to be from his commentary or they are narrated through Ibn 'Abbas who had acquired it from 'Ali (a). Ibn 'Abbas was once asked, "What is the relationship between your knowledge and your cousin's (namely 'Ali's)? He replied, "It is like that of a few drops of water to an open sea." Ibn Abi l-Hadid says, "Scholars of spiritual discipline and Sufism trace their origins to 'Ali (a) and the khirqa which is still the sign of Sufism indicates that." Ibn Abi l-Hadid says, "Everyone knows that 'Ali (a) was the inventor of Arabic syntax (al-nahw) and literature and that he dictated Arabic grammar to Abu l-Aswad al-Du'ali. For example, he taught the following rules to Abu l-Aswad: that words are divided into three categories: nouns, verbs, and prepositions; nouns are either definite or indefinite, and there are four inflections: raf', nasb, jarr, and jazm. Ibn Abi l-Hadid says, "He (a) was the master of eloquent orators and writers. Regarding his eloquence, it has been said, "His words are inferior to God's words and superior to the words of other creations" and his Nahj al-balagha is the best proof of this claim. 'Abd al-Hamid b. Yahya has said that he memorized seventy sermons of 'Ali's and his literal competence has come from them. Ibn Nubata has said, "I have a treasure of memorized sermons whose amount never reduces as I take from it, but rather, it increases. I have memorized a hundred pieces of 'Ali's (a) advices." It is said that he would water the date gardens of the Jews in Medina with his own hands until they became calloused, and he gave all of his profits to the poor, and tied stones to his stomach (so that he could handle the pangs of his own hunger]. It is said that he never said "no" to a beggar. Once, Mahfan b. Abi Mahfan went to Mu'awiya who asked him: "Where are you coming from?" In order to flatter Mu'awiah, he said, "From the company of the stingiest among people (i.e. 'Ali.)" Mu'awiya replied, "Woe to you! How can you say such a thing about a person who, if he had two storehouses, one filled with gold and another filled with straw, he would empty out the one with gold and spend it for the poor, before he would spend his storehouse of straw?" Ibn Abi l-Hadid says, "'Ali (a) was greater than all with regards to forbearance, magnanimity, and in forgiving a wrongdoer. What happened in the Battle of Jamal best supports this claim. When he caught Marwan b. al-Hakam, who was a hostile enemy, 'Ali (a) released him and forgave his great sin. 'Abd Allah b. al-Zubayr swore at him in public, and when he came to Basra with 'A'isha's army, he delivered a speech about 'Ali, insulting him as much as he could. He even said that 'Ali was "the most inferior and the most ignoble among people" However, 'Ali (a) forgave him when he was caught, and only told him 'Go, so I do not see you!' He also caught Sa'id b. al-'As in Mecca who was among his enemies in the Battle of Jamal. But, he turned his back on him and did not say anything to him." His behavior towards 'A'isha after the Battle of Jamal has been famously narrated. When he won the battle, he treated 'A'isha with respect, and returned her to Medina accompanied by twenty women from the tribe of 'Abd al-Qays. They were dressed as men, and each of them carried a sword in a baldric, however, 'A'isha did not know that they were women. 'A'isha swore at 'Ali (a) throughout the journey, claiming that he had dishonored her by making a number of men accompany her. When they arrived in Medina, the women revealed that they were in fact, women, who had accompanied her. After the Battle of Jamal, he granted freedom to all the people of Basra who had fought him and had killed a number of his men. He told his army that none should trouble them, and that anyone who had dropped their weapons was free. He took no prisoners from among them nor any spoils, and did what the Prophet (s) did in the Conquest of Mecca. In the Battle of Siffin, Mu'awiya's men blocked the waterway and prevented 'Ali's (a) army from getting water from the Euphrates River. In fact, leaders of Mu'awiya's army said 'We must kill 'Ali (a) and his men while they are thirsty in the same way that he killed 'Uthman while he was thirsty." 'Ali's army fought and managed to get control of the water from the enemy. Thereafter, his men wanted to retaliate and not let Mu'awiya's army get water, so that they could die of thirst. Imam 'Ali (a) said, "Never will we do that. Allow them to use a part of the Euphrates." Ibn Abi l-Hadid says, "He was an exemplar of geniality and cheerfulness, to the extent that his enemies criticized his geniality as a flaw in his character." Sa'sa'a b. Sawhan and other companions of Imam 'Ali said "Among us, 'Ali (a) was like one of us who did not have any special privileges. While he was humble and modest, he still had such an awe-inspiring personality that before him, we were like captivated prisoners whose hands and feet were tied, held captive by a man with a sword." Ibn Abi l-Hadid says "Both friends and enemies admit that he was the master of the Mujahidun, and that compared to him, no one deserved this title. Everyone knew that the most difficult and the heaviest of the battles of Islam with polytheists was the Battle of Badr, in which 70 of the polytheists were killed. Half of them were killed by 'Ali (a), and the other half were killed by other Muslims with the help of angels. His place in the battles of Uhud, Ahzab, Khaybar, Hunayn, and other battles is famous in history, and do not need to be mentioned." His enemies always boasted that they once fought against 'Ali (a) in a battle, or that someone of their relatives had been killed by him. Once, Mu'awiya was sleeping on his throne. Suddenly, he opened his eyes, and saw 'Abd Allah b. al-Zubayr at his side. He sat up, and 'Abd Allah said to him jokingly "O' Amir al-Mu'minin!, let us wrestle if you agree." Mu'awiya told him "Oh, you speak of boldness and bravery?!" 'Abd Allah said "Do you deny my bravery?! I am the man who went to fight 'Ali and was his opponent in the battle." Mu'awiya said "That is not true at all. If you would have ever stood for a moment against 'Ali (a), he would have killed you and your father using only his left hand, leaving his right hand free, waiting for a fight." Ibn Abi l-Hadid says, "Ali (a) was the greatest worshiper amongst people, and he prayed and fasted more than anyone else. People learned the night prayers, persistence in the recitation of dhikrs, and the recommended prayers from him. And what do you think of a man who was so persistent in recommended prayers that even on the Laylat al-Harir in the Battle of Siffin, a carpet was set on the ground for him in between two lines of the armies, and he engaged in prayer without any fear while arrows flew by his ears from the left and the right. His forehead was like the knee of a camel because of his frequent and long sajdas. Anyone who carefully considers his prayers and supplications will see his glorification of God, his humbleness before His glory, and his prostration before Him, and will realize the ikhlas in him. They will know from what a great heart these prayers have come and through what a grand tongue they have flowed." 'Ali (a) was the master of the ascetics, and whoever wanted to practice self-discipline remembered him. He never ate to his full. His food and clothing were of the most coarse materials. 'Abd Allah b. Abi Rafi' says, "Once I went to 'Ali (a) on a day of eid. I saw that he had a sealed bag. When he opened it, I saw that it contained bits of whole-grain barley bread. He started eating them. I said, "O' Amir al-Mu'minin, why have you sealed that?" He said, "I fear that my children would rub butter or olive oil on them." His clothes were sometimes stitched with bark and sometimes with the fibers of date palms. He always wore sandals made of palm bark. He wore the coarsest canvas clothes. If he had anything besides bread to eat, it would be vinegar or salt. If it ever went beyond these, it would include some kind of plants, and if at all further, a little camel-milk. He did not eat meat except very little and said "Do not make your stomachs the graveyards of animals." Nevertheless, he was the strongest among people and hunger did not reduce his power. He had abandoned the world while the wealth of the entire Islamic empire (except that of Syria) had come to him- and so, he distributed all of it amongst the people. Commentary of Muhammad Baqir Nawwab Lahijani. Ghurar al-hikam wa durar al-kalim was compiled by 'Abd al-Wahid b. Muhammad al-Tamimi al-Amidi, a scholar of the sixth/twelfth century. In this book, almost 10,760 hadiths of Imam 'Ali (a) have been organized alphabetically by subjects of theology, worship, morality, politics, economy, and society. Dastur ma'alim al-hikam wa ma'sur makarim al-shiyam was compiled by Qadi al-Quda'i. He was a Shafi'i scholar who lived in the fourth/tenth century and was considered to be reliable among traditionists. Some scholars regard him as a Shi'a. The book is divided into nine chapters: 'Ali's (a) beneficial maxims, his denunciation of this world, his aversion to it, his sermons, his advice and prohibitions, his answers to questions, his peculiar words, his rare words, his prayers and supplications, and a poem attributed to him. Salman al-Farsi was among the best friends of the Prophet (s) and 'Ali (a). Many hadiths about him have been quoted from the infallibles (a). For example, once the Prophet (s) said, "Salman is one of us, the Ahl al-Bayt (a)." Abu Dhar al-Ghifari (Jundab b. Junada) was the fourth person who converted to Islam. He became 'Ali's (a) defender after the demise of the Prophet (s). He was among the few who refused to pledge allegiance with Abu Bakr. Miqdad b. 'Amr (Miqdad b. Aswad al-Kindi) was among the seven people who believed in the Prophet (s) from the beginning of his mission and became Muslim. After the Prophet (s) passed away, Miqdad did not pledge allegiance with Abu Bakr and sided with 'Ali (a) during the 25 years before he assumed the caliphate. Uways al-Qarani, (Uways b. 'Amir al-Muradi al-Qarani) was a famous ascetic who converted to Islam at the time of the Prophet (s). Uways was among the special companions of 'Ali (a) who pledged allegiance with him and promised to defend him until the last moments of his life, and in doing so, would never turn his back from the enemy [i.e. escape the enemy]. 'Ammar b. Yasir was one of the first people who believed in the Prophet (s) and immigrated to Ethiopia with the first group of Muslims and after the Prophet (s) immigrated to Medina, he joined the Prophet (s). After the Prophet (s) passed away, Ammar stood in defense of the Ahl al-Bayt (a) and 'Ali (a). Under the rule of 'Umar b. al-Khattab, he became the governor of Kufa for a period of time, but since he was just and lived a simple life, some tried to get him dismissed. He returned to Medina and stood with 'Ali (a) and benefitted from him. Ibn 'Abbas ('Abd Allah b. al-'Abbas) was a cousin of the Prophet (s) and 'Ali (a). He narrated many hadiths from the Prophet (s). During the time of the three caliphs before 'Ali (a), Ibn 'Abbas was always of the opinion that 'Ali (a) deserved the caliphate. During the rule of 'Ali (a), Ibn 'Abbas helped him in the battles of Jamal, Siffin and Nahrawan and was appointed by 'Ali (a) to become the governor of Basra. Malik al-Ashtar al-Nakha'i (Malik b. al-Harith) was born in Yemen. He was the first one who pledged allegiance with Imam 'Ali (a). He was a commander of Imam 'Ali's army (a) in the Battle of Jamal, the Battle of Siffin, and the Battle of Nahrawan. Kumayl b. Ziyad al-Nakha'i was one of Tabi'un of the companions of the Prophet (s) and of the special companions of Imam 'Ali (a) and Imam al-Hasan (a). He was among the Shi'a who swore allegiance to Imam 'Ali (a) and fought in all of the wars against Imam 'Ali's (a) enemies. Imam 'Ali (a) taught the Supplication of Khidr to him which later became know as supplication of Kumayl . Muhammad b. Abi Bakr (a son of the first caliph) was born in 10/631. He was among the special companions of Imam 'Ali (a) who believed that the previous caliphs had taken the right of 'Ali (a) and said that there was no one more deserving of the caliphate than 'Ali (a). He became the governor of Egypt in the month of Ramadan 36/657 and was killed by Mu'awiya's army in Safar of 38/658. Maytham al-Tammar al-Asadi al-Kufi was one of the special companions of Imam 'Ali (a), Imam al-Hasan (a) and Imam al-Husayn (a). He was of the Shurtat al-Khamis who was a group of men who promised Imam 'Ali (a) to help him until their last breath of life. Zayd b. Sawhan al-'Abdi was a companion of 'Ali (a) who participated in different battles against the enemies of 'Ali (a) and was finally killed by the Nakithun army in the Battle of Jamal. Sa'sa'a b. Sawhan al-'Abdi was one of the companions of 'Ali (a) who participated in the battles imposed upon him. He was among those who pledged allegiance with 'Ali (a) after 'Uthman's death. ↑ Nasr b. Muzahim. Waq'at Siffin, p. 490. Ahmad b. Abi Ya'qub -al, Tarikh-i ya'qubi. Tehran: bungah-i tarjumi wa nashr-i kitab, 1378sh. Bahrani, Sayyid Hashim, Ghayat al-maram. Ed. Sayyid 'Ali 'Ashur.Beirut: mu'assisa tarikh al-'arabi. Ganji Shafi'i. Kifayat al-talib.Beirut: dar ihya' al-turath. Hakim al-Niysaburi, Muhammad b. 'Abd Allah.al-Mustadrak 'ala l-sahihayn. Ed. Yusuf 'Abd al-Rahman. Ibn Abi al-Hadid, Sharh nahj al-balagha.dar ihya' al-kutub al-'arabiyya. Ibn Athir, Al-Kamil fi al-tarikh. Beirut: dar sadir. Ibn Athir.Usd al-ghaba. Ed. Muhammad Ibrahim Bana. Cairo: Dar al-sha'b. Ibn Maghazili, Manaqib-i 'ali b. abi talib. Tehran: maktaba islamiyya. Ibn al-Nadim al-Baghdadi, al-Fihrist. Ed. Rida Tajadud. Ibn Qutayba , 'Abd Allah ibn Muslim Dinawari. Al-Imamat wa al-siasat. Ed. 'Ali Shiri. Qum: Sharuif radi, 1371sh. Thaqafi, Ibrahim b. Muhammad, al-Gharat. Ed. Muhaddith Urmawi. Mahmudi, Muhammad Baqir, Nahj al-sa'ada fi mustadrak Nahj al-balagha'. Beirut: mu'assisa al-a'lami. Majlisi, Bihar al-anwar. Beirut: mu'assisa al-wafa. Muslim b. al-Hajjaj, Sahih al-muslim. Beirut: dar al-fikr. Muttaqi al-Hindi, Kanz al-'ummal. Beirut: Mu'assisa al-risala. Qunduzi, Sulayman ibn Ibrahim, Al-Yanabi' al-mawada. researched by Sayyid 'Ali Jamal Ashraf. Tehran: dar al-uswah. Sayyid Qutb, Fi zilal al-qur'an. Beirut: Dar al-shuruq. Al-Sharif al-Radi. Nahj al-balagha. a collection of Imam 'Ali's letters, sermons, and sayings. Tehran: Ilmi farhangi, 1378 Sh. Al-Shaybani, Ahmad b. Hanbal, Musnad ahmad b. hanbal. Beirut: Dar ihya' al-turath al-'arabi. Al-Shaykh al-Mufid, al-Ikhtisas. Ed. 'Ali Akbar Ghaffari. Beirut: Dar al-mufid. al-Shaykh al-Mufid, Al-Irshad. Qom: mu'assisa al al-bayt. Al-Saduq, Muhammad b. 'Ali b. Babawayh, 'Uyun akhbar al-rida. Tehran: Intisharat a'lami. Al-Tabrisi, Fadl b. Hasan, Majma' al-Bayan fi Tafsir al-Qur'an]]. Beirut: mu'assisa al-a'lami. Al-Suyuti, Jalal al-din, Abd al-Rahman b. Abi Bakr, Al-Durr al-manthur. Beirut: Dar al-ma'rifa. Al-Suyuti, Jalal al-din, Abd al-Rahman b. Abi Bakr, Tarikh al-khulafa'. Mecca. Nasr b. Muzahim. Waqa't siffin. Qom: Intisharat-i Basirati. Ahmad b. Hanbal al-.Fada'ilu amir al-mu'minin 'ali (s). Ed. Sayyid Abd al-aziz Tabataba'i. Qom: Dar al-tafsir, 1433 Ah. Amin, sayyid Muhsin al-. Sira-yi ma'suman. Tra. 'Ali Hujati. Tehran: Surush. Amin, sayyid Muhsin al-. A'yan al-Shi'a. Beirut: Dar al-Ta'arf al-matbu'at, 1998. Baladhuri, Ahmad ibn Yahya al-.Ansab al-ashraf. Ed. Muhammad Baqir Mahmudi. Beirut: Muasisat al-a'lami, 1974. Irbili, 'Ali b. 'Isa al-.Kashf al-ghumma fi ma'rifat al-a'ima. Beirut: Dar al-adwa'. Amini , Abd al-husayn.Al-Ghadir. Beirut: Dar al-kitab al-'arabi. Ayati, Muhammad Ibrahim.Tarikh-i payambar-i Islam. Tehran: Danishgah Tehran, 1378 Sh. Damiri, Muhammad Rida.Kitab shinasi-yi tafsili-yi madhahib Islami. Qom: Mu'assisa-yi amuzishi pazhuhishi-yi madhahib-i Islami. Husayni Dashti, Mustafa.Ma'arif wa Ma'arif. Tehran: Mu'assisa-yi farhangi-yi arayeh, 1379 Sh. Ibn A'tham.Al-Futuh. Beirut: Dar al-nudwa. Ibn Hisham.Al-Sira al-nabawiyya. Cairo: Maktaba Muhammad 'Ali Sabih. 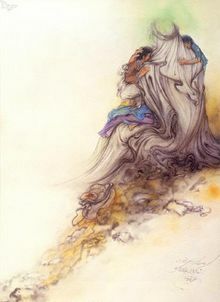 Ibn Shahrashub, Manaqib al Abi talib. Najaf: Maktaba hiydaryya. Iskafi. Muhammad b. Abd allah.Al-Mi'yar wa al-muwazina fi fada'il amir al-mu'minin. Beirut. Ja'fariyan, Rasul. Guzidi-yi hayati siasi wa fikri Imaman-i shi'a. Qom: Nashr-i ma'arif, 1391 Sh. Al-Jawhari, Isma'il b. Himad, Al-Sihah. Beirut: Dar al-'ilm li-l-malla'in. Kumpani, Fadl allah,'Ali (s) kist. Tehran: Dar al-Kutub al-Islamiyya. Al-Mas'udi, 'Ali b. Husayn, Ithbat al-wasiyya li-l-imam 'Ali. Beirut: Dar al-adwa'. Muhammad b. Sa'd, al-Tabaqat al-kubra. Beirut: Dar sadir. Al-Nuri, Husayn b. Muhammad Taqi.Mustadrak al-wasa'il. Beirut: Mu'ssisa al al-bayt. Pishwa'i, Mahdi, Siri-y pishwayan. Qom: Tuhid. Qadi Quda'i, Dastur-i ma'alim al-hikam. Tra: Firuz Harirchi. Qom: Danishkadi-yi 'ulum hadith. Al-Qunduzi, Sulayman ibn IbrahimYanabi' al-mawada. Tehran: Dar al-uswa. Al-qurtubi, Muhammad ibn Ahmad Ansari, Tafsir al-Qurtubi. Beirut: Dar al-ihya' al-turath. Al-Qutb al-Rawandi, Minhaj al-bara'a. Qom: Mu'ssisa imam al-Mahdi (a). Riyshahri, Muhammad, Mawsu'at al-Imam 'Ali b. Abi Talib. Qom: Dar al-hadith. Sayyid ibn Tawuus, 'Ali b. Musa, Farhat al-ghari. Shahidi, 'Ali az zaban-i 'Ali. Tehran: Daftar-i Nashr-i farhang-i Islami, 1379 Sh. Shahidi, Zistnamay-i Imam 'Ali. In: Danishnamayi imam 'ali. Tehran: Markazi nashr pazhuhishgah farhang wa andishi Islami, 1380 Sh. Shahristani, Muhammad ibn 'Abd al-karim.Al-Milal wa al-nihal. Ed. Sayyid Muhammad Gilani. Beirut: Dar al-ma'rifa. Shushtari, Qadi Nur Allah.Majalis al-Mu'minin. Tehran: Kitab furushi islamiyya. Shushtari, Qadi Nur Allah.Qamus al-rijal. Tehran: Markazi nashri Kitab. Al-Tabari, Muhammad b. Jarir, Tarikh al-rusul wa l-muluk. BeiruT: Mu'assisa a'lami. Zubaydi,Muhammad b. Muhammad Murtada, Taj al-arus. Ed. 'Ali Shiri. Beirut: Dar al-fikr. Tabataba'i, Al-Mizan fi tafsir al-Qur'an. Qom: Jami'a-yi mudarrisin. Legenhausen, Muhammad, The Gospel of the Shi'a of 'Ali (a). Mutahhari, Murtada, Master and Mastership, Islamic Seminary Publications, ISBN 0-941724-15-8. 'Ali b. Abi Talib, Nahjul Balagha Part 1, The Sermons, Complied by 'Allamah al-Sharif al-Radi. 'Ali b. Abi Talib, Nahjul Balagha Part 2, Letters and Sayings, Complied by 'Allamah al-Sharif al-Radi. 'Ali b. Abi Talib, The Richest Treasure; Imam 'Ali's Letter to Malik al-Ashtar, the Governor of Egypt, trans. Rasheed Turabi. Jordac, George, The Voice of Human Justice (Saut al-'idalat al-insaniyya), trans. M. Fazel Haqq, Ansariyan Publications – Qom, First Edition 2000, ISBN 964-438-158-0. The names in brackets are short-term caliphs officially recognized only in Baghdad. This page was last edited on 19 February 2019, at 13:18. This page has been accessed 232,460 times.